Our generation is dependent on technology for almost everything. Then why grocery shopping should be left behind? To be honest, a few years back, the only outing venue for our working class every weekend, used to be a grocery store. The long billing queues made it worst. But with time technology flipped the coin and changed everything for good. Thanks to the e-commerce industry for making online stores for selling groceries. It saves both time and effort. The common man can now utilize their weekends for more constructive work (or just sleep till noon). You can't deny that selling grocery online is the new trend in online business. In 2016, online grocery market of India was placed on 5th position in the Asia Pacific region. According to a survey, the Indian grocery retail market is exponentially growing in major cities. The entire value of this online industry will cross $650 billion USD by 2020. So if you wish to start a new online grocery shop, there is no better time than now! But no matter how promising the stats are, this online genre is different from others. For example, grocery products are perishable; you need to sell things before it’s too late. There are many such challenges you will face in order to run the store successfully. I’ve listed a few tips that may help you start a blooming and popular grocery business online. A true business genius will always find opportunities in the market. After all running a successful grocery store and managing large inventory is not a child's play. In order to make your grocery store successful, you must think like a successful entrepreneur. If you are planning to start an online grocery shop, then you need to decide which areas it will cater. This crucial decision has to be made based on a lot of factors like social preferences of people who reside in that particular area, their initial response to your online grocery and market competition. You must have an e-commerce solution that can easily analyze leads for you from different areas. It will also support you in gaining an edge over the other local brick stores in the revenue generating areas. Creating an e-commerce website is a major step to set-up your online grocery store. You have two options to proceed with this one. You can either go for the conventional site making the process that will be lengthy and costly. Or you can make a smart move and partner up with an expert e-commerce service provider to save time and money. StoreHippo provides quick e-commerce solutions for your online grocery site. You can easily log into the platform and set up your own store. What’s more, you can choose from their existing theme library or try your hands at designing with the easy drag-drop functionalities and simplified back-end. Inventory is the soul of any grocery business. You need to have diverse products to attract new customers. And for that, you need a solid inventory management tool. StoreHippo gives you the freedom to list various categories and sub-categories in a multi-tier hierarchy in an organized way for your store. It has unique inventory management tools that will help you in database management with ease and proper flow for finding each product in your grocery store. Your business is connected to your customers via delivery services. Make sure you choose a reliable one. It’s so crucial that it can make or break customer relationships. The delivery service you choose should be prompt in the areas where you operate. Go for an e-commerce solution that integrates with your grocery delivery partner. It must have features that update the clients on their order status via text. Some advanced features can also help you track the delivery live. StoreHippo gives you an edge over the others, by providing such competent features to manage your deliveries with ease. Every business needs expansion at some point in time. To grow your online grocery business, you can either expand your inventory or tie up with vendors who sell products that you wish to add in your store. Make sure your e-commerce platform support multiple seller integrations. You may include the multi-seller feature and add sellers or you may also integrate with other stores to promote desired products you want. StoreHippo provides integration with multiple platforms and also provides exclusive admin features to manage all the vendors. Your online grocery store needs solid marketing if you want to make it successful. Your store’s online presence must be felt by your target audience. You can go for on-page and off-page SEO of your site. Make sure you also use offline marketing means like distributing flyers banners and coupon pamphlets at local places. Discount and offers are the most tested and used method of marketing. Go for an e-commerce partner that has a dedicated marketing based module for your grocery store. This will help you manage heavy traffic in an organized way. StoreHippo gives you the flexibility to design new offer-banners for your site and also generates discount coupons and vouchers to help you get unique codes. It also helps you differentiate the regular customers from new customers and generate new discount schemes accordingly. Having Social media presence is mandatory for all online businesses. Then why leave our grocery stores. Social media helps you advertise new deals and offers. It also helps you interact with the customers directly and get their feedback. You can introduce a new interactive quiz and games to know the psychology of your target audience and cater to them accordingly. With StoreHippo by your side, social media marketing is a child’s play. StoreHippo integrates with your social media platforms and helps you interact with customers. It even helps you examine the social media analytics and see how many leads got converted and through which platforms. Online grocery is the new trend for grocery shopping and mobile makes this process easy. M-commerce is the new buzz in the retail industry. This trendy technology has not only simplified things but also made online shopping easy and fun. You don’t even have to open your systems or laptops to shop online nowadays. Mobile does the needful. Plus you can operate it from anywhere, without much hassle. Make sure your grocery store is mobile responsive. Test it on multiple devices to be sure it has an impressive look and feel. StoreHippo offers mobile responsive themes and simplifies the dashboard so that you can operate things easily on mobile itself. When it comes to payments, customers look for multiple options. Some are comfortable with payment through their cards while others prefer payment wallets to avail cash-back offers. Look for a platform that provides a flexible yet reliable payment solution. Make sure your grocery store can integrate your site with online payment wallets and payment gateways. You can even introduce cash on delivery. Your delivery service can collect the cash and deliver it to you. StoreHippo integrates with multiple payment gateways and wallets thus allowing you to give payment options to your customers. It may seem to be a luxury, but you need this feature in the long run. Scalability deals with the right sync of software and hardware configuration. Every platform has factors like product quantity, system configuration, etc. that drives the performance of your grocery store. Store performance is all that matters. StoreHippo provides features like unexpected heavy traffic, store expansion, efficient store performance and lifelong support for your business growth. 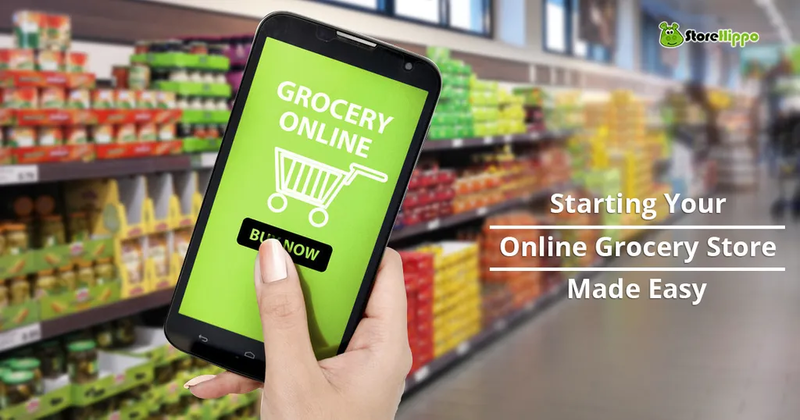 Select an e-commerce solution only after considering all these features that will help you develop a cutting-edge online store to sell groceries. These features will increase customer traffic and enhance your sale. You can also introduce various modules for sellers like the bulk upload of products, social login, and so on.